I want to wish all my visitors a Happy and Healthy New year. 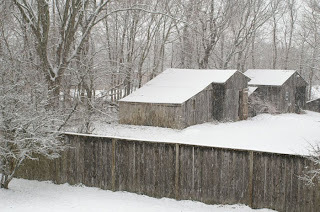 We got a nice snow storm today, just enough to blanket the world with white. Blessings to all who visit and your families, as well. In case you hadn't noticed, this is my goof off time. I am totally burnt out and decided I needed to spend time doing whatever, whenever, for a bit;) My husband is putting in the new stairs and now we need treads. So, I got out my new braid aids to try one and the colors were way too bright. 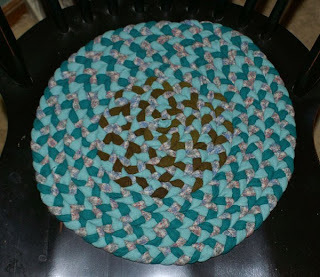 Since I already started a braid, I decided to make it into a chair pad for my office. It gave me some practice using the braid aids and I think my braiding is neater this time. It is also a lot easier on my hands. I have decided that, if i want to make treads for the stairs, I need to be more efficient as well. I will gather up darker colors and make 3 boxes, then strip the wool, sew the ends together, then braid. I think it will go faster that way, than making it as I go. 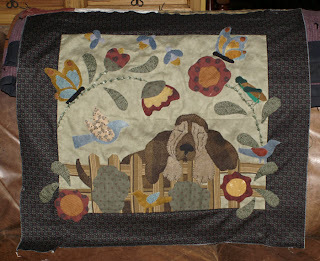 Tonight I worked on my dog quilt. I have added some new things, since I last showed it and tonight, I added three fireflies and the grasshopper. I messed up on the legs, so decided to call it a night. Now I will add the details on the critters and flowers and then decide if I want to add anything else. The firefly and grasshopper are courtesy of Wee Folk Art. 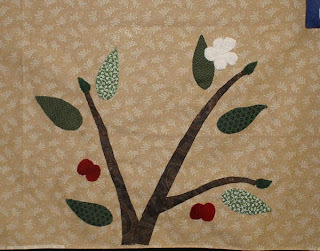 If you are looking for fun appliques or projects, check it out. As for old, this santa was painted in the early 80's, it is almost an antique;) It is one of those figures that you bought and painted yourself. 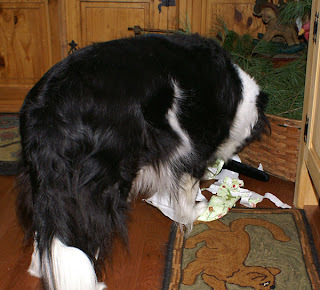 And this is what it is like at my house, the dog gets presents on Christmas. He loves to open presents. I had to throw away his favorite squeaky toy, it was getting really gross. 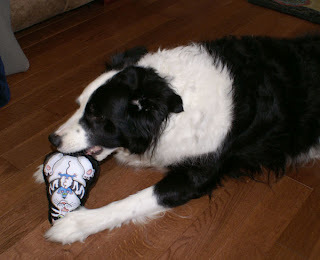 Now he has a new toy to play with, but he has a hard time getting it to squeak. He really gets off, trying to torture his squeaky toys. I started a piece for my daughter to hang in her new apartment and got behind. She stayed with me, for a few days, so I couldn't work on it. She left yesterday at 5pm, so I worked most of the night and half of today, to get it finished and it is done. I wish I had more time to think about things or get some fun embellishments, but not time to go out and shop, so I used what I had on hand. Hopefully she will like it. 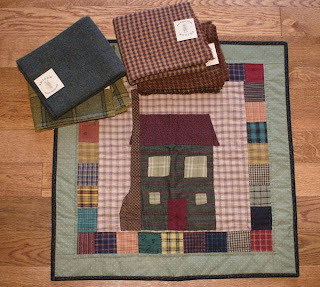 I used designs from a pattern in my laural burch book and used wools instead of fabrics. As usual, I finish at night and had to use flash, and hopefully you can see the details. As I was writing in the labels for the post, I went to put dog and realized I made a horse tail on him, lol. It shows you what happens when you work too long and tired;) I hope all of my online friends and visitors have a wonderful and blessed Christmas, filled with love and family. I am behind on my daughter's piece, since she had to stay here a few days, while her car was being fixed and not sure if I can finish it by tomorrow night, will see. One of the gifts this week was a late birthday present from my friend mimi. She hooked this piece for me and then mounted it on the base. It looks great on my bureau. One of the items in the box was a prim gingerbread, it was perfect for my candle box. Then my friend Kelley, sent me another box, as if one wasn't enough. 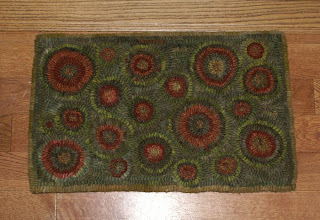 This one had some wonderful handmade goodies and this rug, she made for me. I love the colors, it fits perfect in my home. 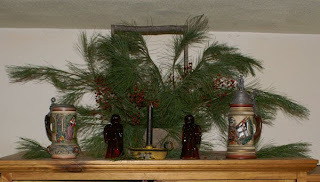 And this tree is a find, that I got at a consignment store. I had to have this wonderful feather tree and next year I will make some real decorations to put on it;) I feel so blessed with my family and friends and my wishes that all who visit will be blessed this Christmas with family and Love. I am truly blessed with friends I have met on the internet and their generosity and talents. Today I received two packages, I feel spoiled. The first was from Bren, Hey Diddle Woolies. She belongs to our ebay group, USAPRIM and was a prize giver in one of our contests. She didn't just send a prize, she went through the trouble in making me a wonderful quilted piece, that I can enjoy in my home. I can't believe how thoughtful it was and was never expecting something some wonderful. And to top it off, she sent me beautiful wools from her stock. New wools are a treat for me and I will definitely use the wools in my next big rug. 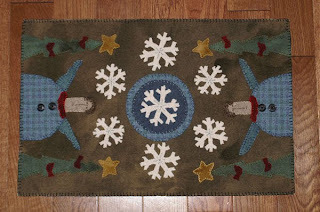 I want to make a large rug for my living room, so I have been keeping all the nice wools that people send me, along with some I bought, so this year I will design and work on it. The second package was from my friend Kelley. She truly spoils me. 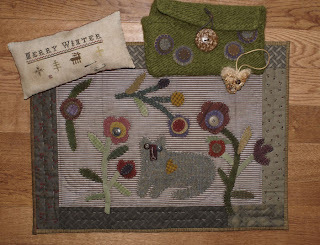 Not only does she make me wonderful gifts, but she always sends me beautiful fabrics and books from her stash. I am really going to have a ball this year, making quilts with all of the fabrics she has sent me. I love the punch needle sheep, they look good on a shelf, standing against a prim box that I have. The punched pillow is now in my box shelf with some strawberries and a pear, that I made. I can't wait to start some patterns in the books and enjoy reading the copies of Mercantile Gatherings. This magazine is coauthored by TIffany, the same woman who makes the wonderful patterns, that I use in some of my punches. Now the goof? Who else, buy Izzy. Izzy who does not seem to have a very good memory and didn't learn her lesson yesterday. My brother was visiting and had the door open while he said goodbye. 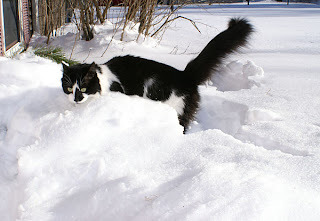 Izzy with her one track mind flew out the door and into a deep snow drift. The poor girl was mortified when she landed and sunk into the snow. She was crying and struggling to get up and out of the snow. Will she ever learn? 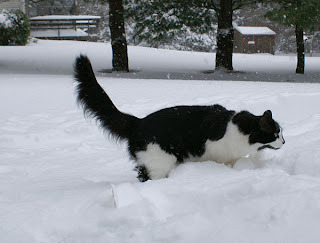 We got quite a bit of snow last night and it was still falling this morning. I wanted to get a picture of the dog in the snow, but there was no path, so he just stood at the top. 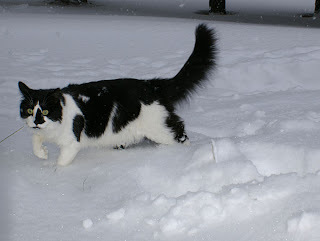 But, Izzy saw her chance to get outside and made a flying leap......right into the snow. 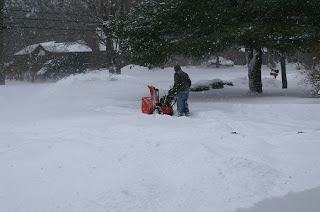 Poor Bill had to spend his day plowing the driveway and paths. Snowplows are a wonderful invention. Some of the gifts I made have arrived at their destination, so I can show them now. I had a swap with my quilt group and we could only use what we had in the house, luckily, I have plenty of crafting supplies. Unfortunately my partner lives in holland, so I had to limit what I made for her and couldn't spoil her, as I would have liked to do;) I made her a penny mat, using a design from Primitive Blessings as a start, the angels. Then I added the rest to make a fun and unique mat, just for her. 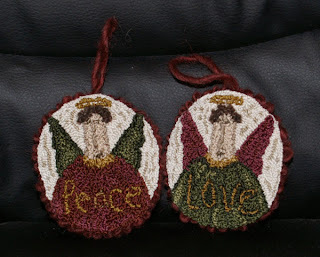 I also used the angel to make a pair of punched ornaments. I am not great at doing the lettering. I just love using Tiffany's designs, they are so fun to do and wonderful ideas for gift giving. 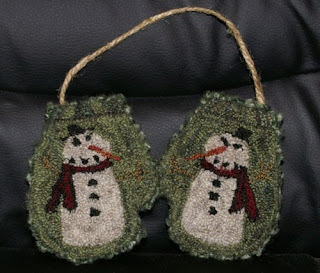 The third item I made was a pair of mittens, that she can hang on the hook, door, or wherever, she would like. I used one of Tiffany's snowmen and modified it a bit. This was before I cleaned it up. Taking pictures helps me to see what I might have missed with loose strands or areas that need to be teased back in. I also made her a nativity set and some other little goodies. 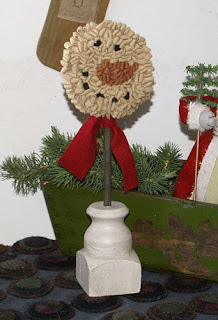 I love making things for fellow crafters and sharing during the holiday season. One of the things I love at Christmas is Nativities. 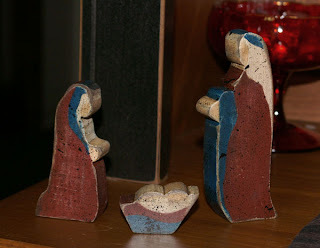 This nativity was our first, it is italian plastic, lol. I just love this set and I am always on the lookout, at the thrifts, for pieces that match. We got it at a discount store that is long gone, so I have to rely on finding them second hand. It is a great set for a kitty house, they can't break this one;) The wonderful stitched pillow was a swap present from my friend Imi, in Holland. 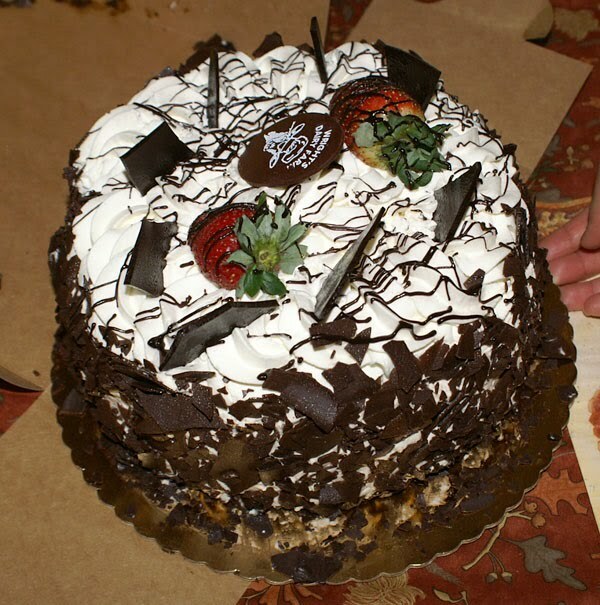 I really wanted a piece like that and didn't have time, so I was so happy when I found that in my goodie box. I found this wooden horse at the thrift store. 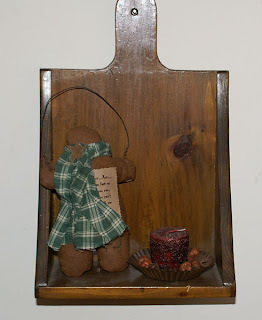 I do like brighter folk art toy items, to decorate too. It cost me a whopping two bucks. I love this sled and wish I had gotten another. I got it from a post Christmas sale. 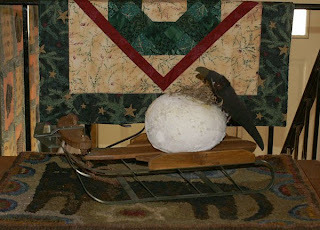 The snowball and crow was made as a gift, from my good friend Jacque. 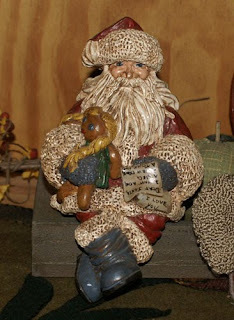 And from Christmases past, this hand carved Santa. Yes, I carved him myself. I am not a great carver, but I have made a few things and enjoy making things with wood. I don't know if I would call this thrifting, but I found some items today in our local consignment store. I actually find nicer things and some antiques, and a lot cheaper than the thrifts lately. I wanted a big basket for my dining bureau, but I guess I got one, too big. It just didn't look right sitting up there, so I put it on the floor and an old piece of cloth and guess who decided it was a fun place to play hide and jump out at the dog. It is a wonderful old basket, with the wood staves on the outer sides and bottom. There is a little damage, but the basket is still in good shape and perfect for prim decorating. I played around with what I had and some more pines from outside. Would love ideas on what to do with it. 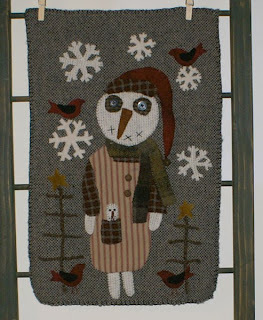 I was thinking old quilts and dolls would be nice too. 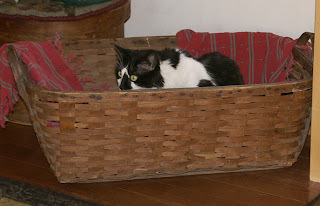 If you have a picture of a big basket and how you use it, would love a link, to see it. The cardinal was a swap gift this year and the sled, something I painted years ago. Izzy loves to follow me around and play games, as you can see, when I put the other items back on the bureau. 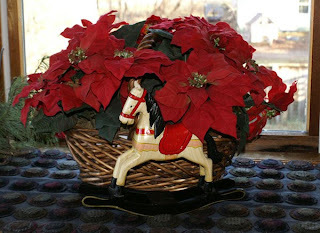 I spent half my time, vacuuming the cat hairs, off of the fake poinsettia. I also found another tin candle holder in the sale aisle, this time in black, for only 2 dollars. 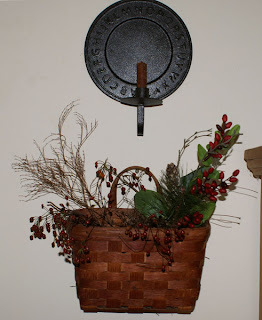 I hung it above the old basket, I found, earlier this year. 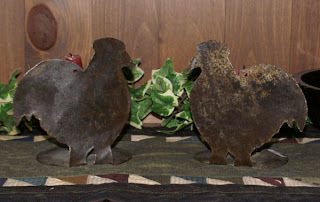 Another fun find today, was this pair of folk art rooster, candle holders. 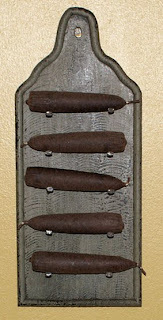 They are hand hammered, they look great on top of my kitchen cabinet, but had to take a picture in a lower spot, to show you. I was able to finish the punch I started when my arm gave out, luckily there wasn't too much left to do. It is ok, but not what I wanted, lost the detail in the lettering. It says Believe. This is a pattern from Primitive Blessings which you can get as an epattern. 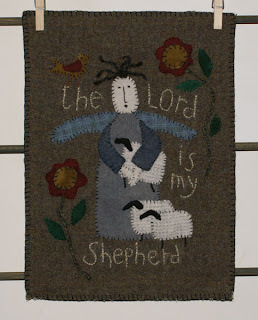 Another piece I made this week, a small wool hanging from one of Tiffany's designs at Primitive Blessings. I have always loved this one and want to do it in a quilted piece, but for now, a small one was perfect as a gift. Of course I had to add my own little things, the flowers and bird. I enjoy going to other blogs and seeing all the wonderful decorations and Christmas trees, but this year I only put up my small ones. My large tree is usually decorated with cats, yes, all cats! I have been collecting them for years, so that is my theme. 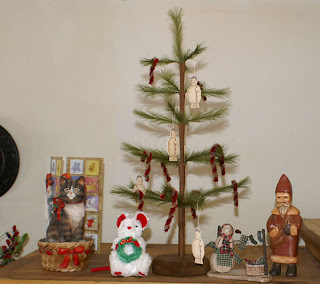 Since I couldn't put the tree up, due to obnoxious kitties, I put my tree topper out, so I could at least enjoy that;) I like the cat santa, but I wanted a cat angel, so maybe next year, I will make my own. Today I got two surprise boxes from my group swaps. One was from our ebay group, USAPRIM which consists of a group of talented ladies who create primitive goods for sale on ebay. 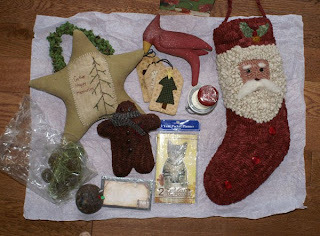 I got lots of wonderful items, to use around my home and couldn't wait to hang them up. I am amazed at all of the beautiful work she did. 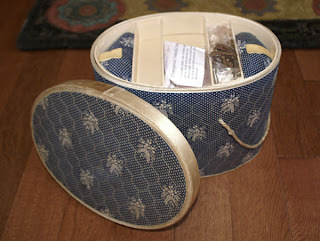 My other box was from a fellow quilter on my primitive quilt group. She made me a wonderful kitty hanging, she knows I love cats;) She also made me a cross stitched piece and little did she know, that I really wanted one, but have no time to make one, so it was the perfect present. The purse she knitted and felted, what beautiful work. I also had a good day shopping yesterday, got lots of goodies for presents and found myself another candle holder. I can't have to many of those, lol. I stayed home today to finish up what I started, it was hard to do the punch, but it was a small amount, so I did it. Now I have to get back to the cellar to spray the last side of my nativities. I am happier with these sets, even though they are not perfect. And for those who asked, I am not selling these, they are for presents. I may do some next year and will be working more with wood and some carving, so will see what I come up with. Another happy thing for today is, I won a contest:) I won 4 half yards of Patrick Loose's new fabric. I can't wait to come up with a design to use it in. 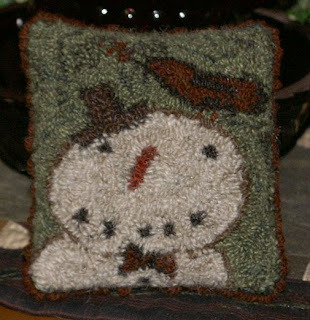 Check out his site, he has lots of fun and whimsical patterns. One of the things that killed my arm, was a lot of sanding. I do have a small sander, but you can only do so much with those without taking off too much, so most of my sanding is done by hand. 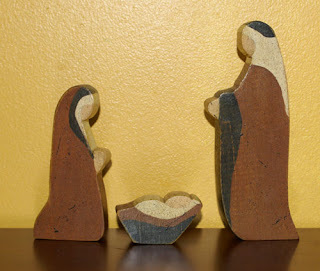 Years ago, I made a few nativity sets and kept one for me, now I am trying to recreate them. I had to use my set to work from, since I have no idea where I got the pattern, I thought it was from an old BHG Christmas issue. If you happen to have this magazine or book it came from, please let me know which one it was, so I can see if I can get a used copy. This is the set I made. I love it's simplicity. This is the first, new set that I attempted. I made it smaller and use brighter colors. It was not what I wanted, and I got carried away with the black. It does look better in person, the flash makes everything stand out more. Now I am working on 4 sets at a time, still in the painting stage. I have to do a coat and then go over again with a second coat. I guess trying something over again, is not smart when you are making a few at a time and rushing to get them done. They will not be exactly like the first set, but hopefully the recipients will like them. Yesterday I decided I was going to sand the sets of things, I am making as presents. That is a lot of sanding and then I had to clean the house and spent the night punching wool into weavers cloth. That did it for me, now my whole arm is in pain, so I could only paint a little today with braces on. 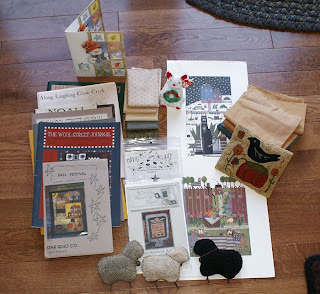 This week I received a fun package from my friend Joanne. She sent me lots of kitty goodies, including a mouse. She said her kitty dropped it in my box, so she took it as a sign that he wanted to give the girls a present. 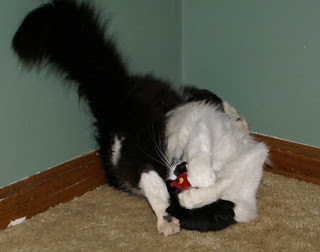 Dora could care less, she is not into mice, but Izzy just loves it. She really loves to play and she even sat on the bench watching me paint today. She has come a long way, since the psycho kitty stage. 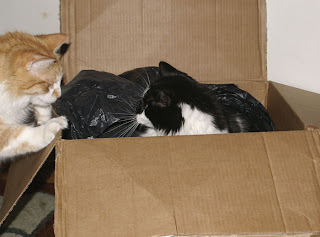 Later on, she discovered the box that it came in, which still has the wool she sent. Izzy loves to lay on things and it was a great place to relax. That was until Dora came along and decided to do a sneak attack. I seemed to get hit with another cold, this time a light head cold. 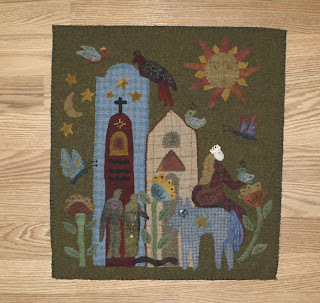 I found this design on Primitive Blessings. It is a freebie design and just loved the look, so I made a little piece to hang on my rack. I added a hat from another of her designs, and then added my own things around it. 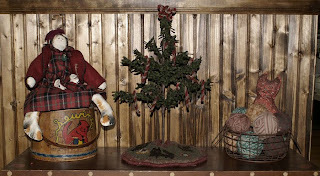 I used old brown yarn for the trees and green floss for the couching. Not sure if I should add ornies, or leave it plain. 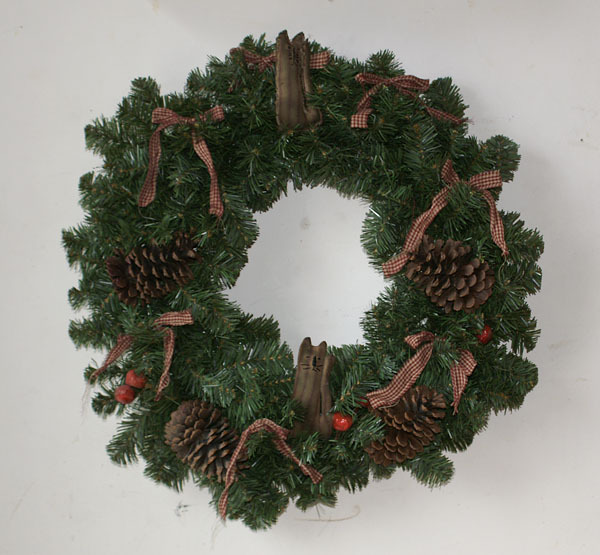 If you are looking for great primitive designs to make some items as gifts, check out the site. There are freebies and great epatterns. Since I did not put up a big tree, I went with an alpine and placed it on my cheese box. I put some of the wonderful prim ornies that my friends gave me. 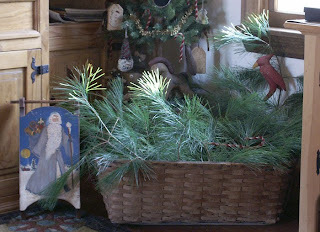 You can get alpine trees at the craft store and they are always on sale. I put my Miss Pooties kitty under the tree, but the snowman ornie makes it look like a snowman doll, lol. The horse is something I made years ago. I decided to sand and antique it a bit and it looks great under the tree. 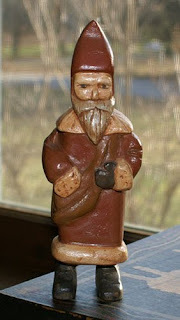 If you have older items form when we all made country, a little walnut spray, will do wonders. I have been experimenting with wool yarn and punch needle and love the look. 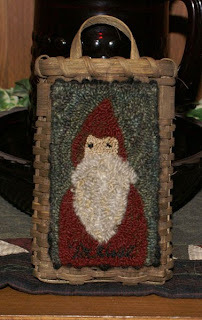 I used lopi lite and some vintage yarn I had to make this piece. I used a 7 height on the design and a 6 for the background. This is a design by Kelly Belfast that she made for our group to use and it was fun to punch up. I used a cameo large needle on jo anns weavers. Their weavers has more stretch to it, so great for the thicker yarns. You do have to be careful with the lopi yarns, they can tear as you pull the strands apart, so it is more time consuming, but well worth the look. 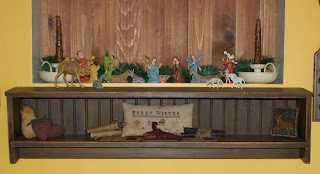 I have been doing a little decorating as I go and this is how I fixed up my bench this week. The feather tree was made by my friend Joanne. She even hooked the tree skirt to go with it. The candy canes I made by using pipe cleaners and spraying them with walnut spray, then sprinkling cinnamon on them. I dried them in my front loader, but you can dry them in the oven on low too. I found the wire basket at the home store for 4 dollars and then I made new rag balls with christmas colors. I just took my pumpkin balls and left the orange fabric on and put the new color over it. It saved on having to use more fabric and made the balls a bit bigger. 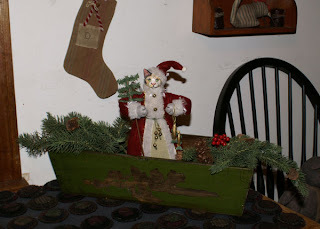 Then I added my new/old firkin and kitty. 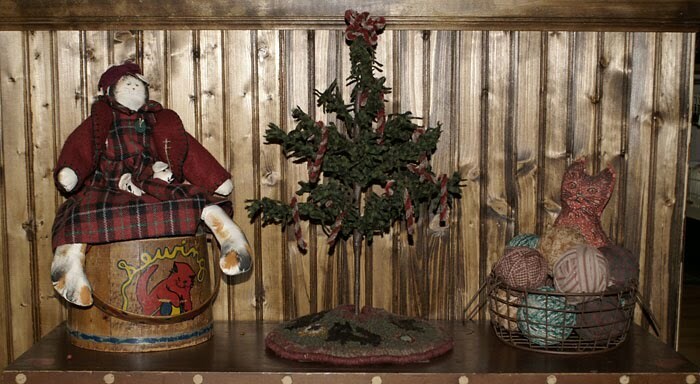 I am one of those, that starts pulling the Christmas decorations out, the day after Thanksgiving. Sadly, I cannot put up my big tree with all my collectible cat ornaments, because of two very obnoxious kitties. Yesterday I washed my big penny mats and put them back in place along with a few new decorations and this morning they were all over the place. I could hear Dora and izzy all night, racing through the house, flying across the tables and knocking down everything in their path. I seriously need to start making things for me, in January. At this time in the season, I am busy making presents so no time for me or sales. I hate to make things too early, things and tastes change, so who knows what new patterns and ideas, I might have next year. I decided to take out things I had and redo them a bit, for now. 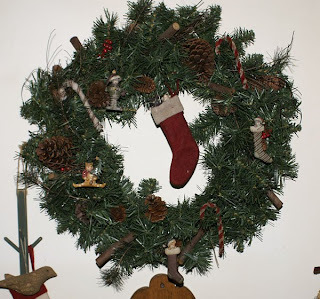 I had an old wreath with the ugly bright velvet bows, so I took those off and added homespun and a couple of kitties. I like to keep them simple, then next year I can put something new on, no glue, I just stick them on. 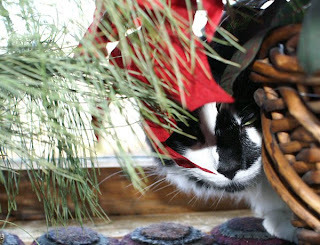 Scrap fabric and handmade kitties on an old wreath; Zero dollars. The second spot I did up was the top of my tv unit. I used the wood planter I got and added fresh greens from my neighbors pines, shhhhh;) Then I cut some red berries from my other neighbors wire fence. They are all over grown and i am just trimming them for them;) A candle holder and my red glass angels and a new look for zero dollars. I have some other things I am doing and will share my cheap and free decorating with you, through the coming month. I will also share ideas where I can. As for the kitties, I used a basic shape and heavy cotton ticking. One I sewed inside out and turned, the other I sewed from the outside to give it a rough edge. I like the rough edge best. Then I used floss to make a face and stained with walnut ink. You can make simple cutouts like these from cookie cutter shapes and sew wrong sides together. Leave about a half inch to the edge and after stuffing, use your scissors and rub the edge. This will pull the loose threads out and leave the remaining threads raggedy. I hope everyone had a wonderful day today. 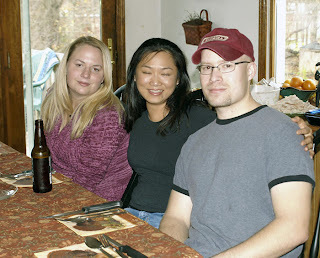 We enjoyed the day with our kids and DIL, so it was nice without being too crazy. This is not a great shot of course, but this is what my family looks like, minus dad who is sitting at the end of the table. And this is what my son thought would be a good dessert, a birthday cake for me. I got to blow out the candles, they got to eat the cake, haha. I am cannot eat cake because of my allergies, so I got to imagine how good it taste;) The cake was from a local Dairy, and called Holy cow chocolate cake, very fitting.